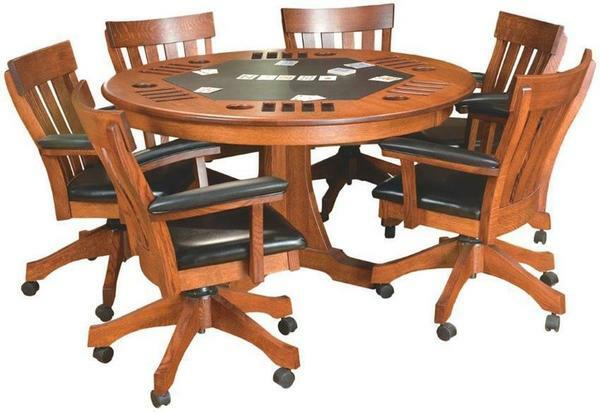 This Amish Handcrafted Poker Table is shown in beautiful quarter sawn white oak wood with a Michael's Cherry stain. You also can choose to order this in walnut, oak, cherry, brown maple or hickory wood with a wide variety of finishes. This game table will accommodate size players and is available in a 48" or 52" diameter. The table center is leather choose from our many leather colors to customize the look. Each player has a cup holder and four rectangular chip slots to stack their chips. Order our Amish Signature Mission Game Chairs to complete the look for your new game room furniture. Quality Takes Time – Typical Build Time for This Piece is 18 to 20 weeks.